What Kinds of Problems Can Result From Thumbsucking? While there are actually two separate but similar issues, pacifiers and thumbsucking, they can cause many of the same problems. Usually, a pacifier habit is a bit easier to handle because children find it less difficult to give up. However, if either of these habits continue past the age of four they can cause several issues. The shape of the jaw, the bite and the teeth can all be adversely affected. As for the teeth, an “open bite” may develop which prevents the top and bottom front teeth from touching, even when biting. This must be corrected with braces in early adolescence. Also, the development of the jaw and facial structure can be permanently altered, and speech problems can also occur that require braces and/or speech therapy to correct. How Can You Help Your Child Overcome This Habit? 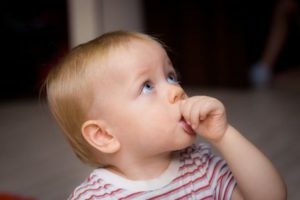 Use praise and rewards for each day or night that your child hasn’t sucked their thumb. A sticker for each day with a prize at the end of the week can also work! There are some great books and videos that can help your child make the decision to quit on their own. If a child feels anxiety, those feelings can contribute to their habit. Addressing this root cause by providing extra comfort or seeking out therapy may help. If your child puts their thumb in their mouth while sleeping, a physical barrier might work. Examples include taping a sock around the hand, applying adhesive bandages to the thumb, or even wearing thin winter gloves. There are also some safe but bitter-tasting liquids (designed for both nail-biting and thumbsucking) that may make the thumb or pacifier less appealing. Above all, it’s important to avoid shaming or punishing a child in an attempt to “make them” stop these habits. These methods aren’t likely to work and can damage a child’s self-esteem and self-worth. Finally, you can always ask your family dentist in Newbury Park at your child’s next visit for additional ideas or about a device for the mouth that discourages this habit. Dr. Gary Chaffee is a California native and has enjoyed practicing dentistry for over 40 years. In addition to his general and restorative practice, he provides orthodontic and pediatric care as well. Active in several volunteer and professional organizations, he is dedicated to providing excellent dental care to his community. He can be reached via his website, or at (805) 480-0033.